As an F-1 student, you must comply with certain immigration laws governing your stay in this country. We encourage you to go through all the sections listed below and review all the important immigration information for F-1 students. To maintain your legal status, you must follow the rules below. If you do not abide by these laws, the U. S. Citizenship and Immigration Services (USCIS) will consider you "out-of-status" and therefore in violation of the conditions of your F-1 immigration status. You will then have to apply for reinstatement and run the risk of being required to leave this country. In order to remain in status, students must adhere to the following guidelines. Maintain a valid U.S address at all times and update your CSUN Student Portal account. It is important that you update your personal information (such as U.S address, email, phone number etc.) via the CSUN portal within 10 days of the change. You may visit UPDATE PERSONAL INFORMATION for a step by step information guide on how to update your Personal Information in SOLAR. The U.S. address is required to keep your SEVIS immigration record in good standing. Maintain a full course of study during each semester (12 credit hours for undergraduate students; 8 credit hours for graduate students) at the school listed on the currently valid I-20 Form. Attend classes regularly and make satisfactory progress toward completion of your degree program. Enroll in no more than the equivalent of one online class or three online credits per semester to count towards your full-time enrollment. Note that if you have one class left to take to graduate, this class must be an in-class traditional course to be in compliance with legal guidelines governing your F-1 status. Make sure that any changes are appropriately listed on your I-20 (name, major, educational level, sources of funding). Do not transfer schools without authorization. If you do transfer schools, make sure that your International Student Advisor transfers your Student and Exchange Visitor Information System record prior to the start of classes at your current school. Complete transfer-in process when you change institutions. This process must be completed within 15 days of starting classes at your new school. The transfer is not complete until you have registered for classes at the new school and received an I-20 confirming the completion of your transfer. Do not accept unauthorized employment. All off-campus employment must be pre-authorized by the USCIS or an international student advisor in the International and Exchange Student Center (IESC). If you work on campus, you may work up to 20 hours per week while school is in session (fall and spring), and 21 hours or more during all breaks (summer and winter). USCIS considers every employment under 20 hours as part time and every employment over 20 hours as full time. Maintain a valid passport at all times. Make sure to renew your passport six months prior to the expiration date. Do not travel outside the United States, even briefly, without the proper documents. Remember to obtain a travel signature on your I-20 from the IESC. Apply for an extension of your program if you cannot complete the degree requirements by the 'end date' listed on your I-20. Always maintain medical, repatriation and medical evacuation insurance. Student and Exchange Visitor Information System (SEVIS) is an online database that allows the USCIS and the Department of Homeland Security (DHS) to track all international students. Maintain a valid passport at all times. Make sure to renew your passport at least six months prior to the expiration date. Your passport can be renewed within the United States at your country's consulate or embassy. Please contact your country's consulate or embassy at www.usembassy.gov/. A visa is a stamp or sticker placed in your passport at a U.S. consulate or embassy outside the U.S. You must make sure that your visa is valid for your re-entry. An expired visa must be renewed at a U.S. consulate or embassy outside of the U.S. prior to re-entry. This visa is only a permit to enter the United States. Once you are here, your I-20/DS2019 becomes the relevant document that keeps you in status. Your I-20 form expires on the date you complete your studies. This cannot be extended once you have graduated. F-1 students who have applied for Optional Practical Training (OPT) will receive an Employment Authorization Document (EAD) that will show the dates of validity. F-1 students are permitted to remain in the U.S. for 60 days after completing their study program. If you are unable to complete your program of study by the expiration date noted in section #5 on your I-20 form, you must submit an Extension of Stay to the IESC at least 60 days prior to that expiration date. J-1 students must check section #3 on the DS2019 for the expiration date. You must report any change of your major and degree level to the IESC no later than 10 days after the change has been made. IESC is required to report these changes to USCIS. You will need to submit a Request for New I-20/DS2019 to the IESC. A Leave of Absence (LOA) for one semester or one year requires approval from a foreign student advisor. Students must remain outside the U.S. for the duration of the approved LOA. Students approved for a medical leave may remain in the U.S. Students who do not resume studies after two semesters will need to reapply to the university. Download the Request for Leave of Absence. Remember to obtain a travel signature on your I-20/DS2019 from the IESC when traveling outside the borders of the U.S. Plan ahead of time. The IESC currently requires seven to ten business days to process these requests. Travel signatures are granted to students who meet all eligibility requirements. Travel signatures for continuing students will be valid for one year provided the student continues to maintain correct student status. Students who need to travel during the semester will have to demonstrate eligibility in addition to obtaining permission from all professors to miss classes. Professors may e-mail permission to the appropriate foreign student advisor or students may bring letters from professors when submitting I-20's for travel signatures. Students who have applied for Optional Practical Training (OPT) must show a Notice of Receipt from USCIS in addition to proof of acceptable health insurance and a valid F-1 visa in order to request a travel signature. Students who have received an Employment Authorization Document (EAD) or approval for OPT must submit a copy of the EAD as well as show proof of acceptable health insurance and a valid F-1 visa in order to request a travel signature. USCIS recommends that students on OPT show a letter from their employer at the port of entry when returning to the U.S. All students who have either applied for or are currently on OPT should communicate with their foreign student advisor for current information on appropriate documents and immigration regulations. Form I-94 is the Department of Homeland Security's arrival and departure record. The immigration officer at the port of entry enters your arrival and departure information in their data base. Effective April 30, 2013, for travel via air and sea, the U.S. Customs and Border Patrol (CBP) will no longer issue paper versions of Form I-94 upon your entry to the U.S. Instead, the port of entry officer will place an admission stamp in your passport marked with the visa status (F1, J1, etc.) and the letters "D/S" to indicate you have properly entered the U.S. Your arrival and departure information will be recorded electronically in the CBP's database. If you are traveling by land, you will be issued a paper Form I-94. International students may access their electronic Form I-94 at www.cbp.gov/I94 within approximately 24 hours of their arrival to the U.S. All students should keep a printed Form I-94 with their passport in case they apply for future benefits such as work authorizations, social security numbers or driver's licenses. For more information about the new Form I-94 process, please visit the Customs and Border Patrol website. The Department of Homeland Security (DHS) requires all F-1 students to maintain a full course of study every semester. Undergraduate students must enroll in a minimum of 12 units. Graduate students must enroll in a minimum of 8 units. IESC is required to report student enrollment information to the DHS each semester. Only under special extenuating circumstances that fall within USCIS regulations and result in your inability to maintain full time enrollment this semester may you submit a completed Part-Time Request Form and supporting documents (if applicable) to IESC for review. The deadline to submit the Part-Time Request Form to IESC is the week before the last add/drop deadline of each semester. Failure to submit requests by this deadline will affect your student immigration status. If you need drop below the full course requirement because of an academic difficulty, a medical or illness condition, or this is your final semester at CSUN, then please come to the IESC to discuss your case with a foreign student advisor. An Extension of Stay is required if you will not graduate by the completion date on your I-20 form. In order to maintain valid immigration status, you must apply for an extension before the expiration date stated in section #5 of your I-20. If there are compelling academic or medical reasons, the USCIS will approve extension of stay requests. The following forms will be needed. Extensions must be processed before the completion date on your current I-20 form. We recommend that you process your I-20 request at least 60 days prior to your I-20 expiration date. If approved, you will receive a new extended I-20 form. Please note that it is the student’s responsibility to request an Extension of Stay. According to USCIS rules, a student may not extend an I-20 after it expires. Students who do not apply for an extension in a timely manner will be required to file a reinstatement with the USCIS. Non-immigrants may apply for admission to CSUN; however, their visa status may prevent them from pursuing a full course load. Applicants who wish to study full-time at CSUN may apply for a change of status to F1 student status. CSUN assists students with this process once they have been officially admitted to the university and have met the eligibility requirements. To be eligible for a Change of Status (COS) to F-1, the prospective applicant needs to be a CSUN student or have been admitted to a program at CSUN for the upcoming semester. Non-immigrants in the following visa categories are not eligible for a change of status while remaining in the U.S.: M-1, C, D, K, and S nonimmigrants, J-1 physicians admitted to receive graduate medical education or training, J nonimmigrants subject to the 212(e) two-year foreign residence requirement, aliens admitted as visitors under 8 C.F.R. § 212.1(e), WT and WB visitors admitted under the Visa Waiver Program. A change of status can be obtained through one of the following options. 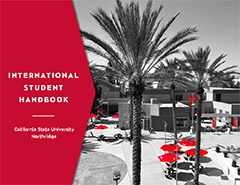 This option requires the student to request an Initial Attendance I-20 from CSUN and travel outside the U.S., apply for an F1 visa at a U.S. Embassy in their home country, and re-enter the U.S. in time for the start of the semester. If the semester has already begun, the Initial Attendance I-20 will be issued for the next available semester at CSUN. Students cannot re-enter the U.S. until 30 days prior to the start date printed on the I-20. Please arrange travel plans accordingly. If this is going to be your first semester at CSUN, which means that you have not taken any classes at CSUN, the Office of Admission and Records will issue you the Initial Attendance I-20. Please contact your International admissions advisor for additional guidance on the issuance of your I-20. If you are a continuing student, which means you are and have been taking classes towards a degree program at CSUN, then the International and Exchange Student Center (IESC) will issue you the Initial Attendance I-20. Please submit the following documents to a FSA for initial I-20 issuance. STEP 1: Meet with Foreign Student Advisor (FSA) at the IESC to review and discuss your immigration status. Submit the signed acknowledgement to FSA-see page 3 for acknowledgement. Student’s letter of explanation. Please state clearly and concisely, the reasons why you would like to change your status to F1. Please type your letter and include your full name, CSUN ID number, the date, and your signature. Please allow 3 weeks to review your documents and issue the Initial Attendance I-20. STEP 3: Meet with your FSA to pick-up your Initial Attendance I-20. Once you become an F1 student, you will be required to have adequate health insurance as mandated by the CSU Chancellor's Office. Please Click here to purchase the pre-approved policy offered by JCB Insurance Solutions. Once you purchase your insurance policy online, the IESC will automatically receive proof of coverage from the health insurance provider and your foreign hold will be removed. If you already have health insurance that you wish to submit for review, please scan and email your proof of insurance to insurance@csun.edu. Please include your first name, last name, and CSUN ID number in the subject line of the email. This is the only way you may submit your proof of health insurance. After you receive your Initial Attendance I-20, you must pay the SEVIS I-901 fee. Information on the SEVIS I-901 fee is available at www.fmjfee.com Please print two copies of the payment receipt: one for your records and one for the visa interview. A visa is a stamp or sticker placed in your passport at a U.S. consulate or embassy outside the U.S. A visa is only a permit to enter the United States. Students must have a valid F-1 visa and CSUN I-20 for their re-entry to the U.S. Information on F-1 visa applications and U.S. embassies is available at www.travel.state.gov. Please verify F-1 visa application requirements, processing times and other information specific to your individual case with the U.S. Embassy in your home country. Students may choose to remain in the U.S. and apply for a change of visa status to F-1 if eligible—refer to Maintaining Legal F-1 Status section for eligibility restrictions. Upon verification of enrollment in or acceptance to an academic program at CSUN, IESC will issue the student a Change of Status form I-20. All change of status applications are subject to approval by USCIS. USCIS may take four to six months to adjudicate your application. It is important that you submit your application in a timely manner, especially if your current visa status does not permit you to study in the U.S. Students are expected to remain in the U.S. until the decision of the change of status application has been made. Note that a change of status is not a visa. You will have to obtain an F-1 visa stamp in your passport the next time you leave the U.S and plan to re-enter in legal student status. All correspondence is done via mail. Please ensure that complete, accurate information is submitted for review. STEP 1: Meet with FSA at IESC to review and discuss your immigration status. Submit signed acknowledgement to FSA-see page 3 for acknowledgement. Student’s letter of explanation. Please state clearly and concisely, the reasons why you want to change your status to F1. Please type your letter and include your full name, CSUN ID number, the date, and your signature. □ Copy of visa that was used to enter the U.S. Copy of online immigration advisement Moodle course Certificate. Submit all the relevant documents to complete the Mandatory F1 check-in for new F1 student. Please allow 3 weeks to review your documents and issue the Change of Status FORM I-20. STEP 3: Please bring the following documents to IESC for review by a FSA prior to mailing to the appropriate USCIS Lockbox Facility. Your FSA will give you a letter of explanation for the COS application, put your application packet together, and give you mailing instructions. Write your SEVIS ID# and “for COS” in memo section of the check. Your advisor will give you a letter of explanation for the COS application, put your application packet together and give you mailing instructions. B-2 or F-2 applicants applying for a change of status MUST wait until USCIS approves and awards F-1 status before attending California State University, Northridge. Other eligible non-immigrants may begin attendance prior to receiving F-1 status. Please check with your Foreign Student Advisor at IESC. Student is not eligible for F-1 benefits until his/her status has been corrected. Consulting with an immigration attorney of your choice is recommended. Student must contact the Office of Admissions and Records regarding the effective date of their non-resident tuition fee. IESC does not require any fees for the services it provides to international students. No fees, under any circumstances, shall be submitted to IESC. If a student is submitting an application to the United States Citizenship and Immigration Services (USCIS), a check payable to Department of Homeland Security will accompany the student's application. Please contact IESC at (818) 677-3053 or email your Foreign Student Advisor for questions and/or clarifications. Students who fail to maintain their legal student status in the United States and wish to correct their status can seek reinstatement of their F-1 student status. Students may fall out of legal status for many different reasons, including, but not limited to, failure to enroll, failure to maintain academic progress or unauthorized part-time enrollment. The SEVIS record of a student who has fallen out of legal status must be “terminated” for the appropriate reason. A student who is “out-of-status” is not eligible for any benefits of the F-1 status. IESC assists F-1 students with the process of reinstating their legal immigration status. Reinstatement applications must be submitted to USCIS within five months of termination. To be eligible for a reinstatement of your F-1 status, students should be enrolled in the current semester at CSUN and/or be eligible to enroll in the following semester. IESC will issue you a new Form I-20 for the reinstatement of your F1 status. A reinstatement can be obtained through one of the following procedures. Option A- Reinstatement by Travel and Re-entry to the U.S. This option requires the student to travel outside the U.S. and re-enter with a new, Initial Attendance I-20. Once the student re-enters the U.S., his or her F-1 clock will start all over again. Any time accrued as an F-1 student under the previous SEVIS record will be lost, and student will not be eligible for F-1 benefits until he or she has met the eligibility requirements for that benefit. The Initial Attendance I-20 will be issued for the next semester at CSUN. Student cannot re-enter the U.S. until 30 days prior to the start date printed on the I-20. Please arrange travel plans accordingly. Students must have a valid F1 visa for their re-entry to the U.S. Student must contact the U.S. Embassy in his/her home country to inquire about the validity of his/her F1 visa, even if the current visa has a future expiration date. Information on F1 visa applications and U.S. embassies is available at www.travel.state.gov. Please verify F1 visa application requirements, processing times and other information specific to your individual case with the U.S. Embassy in your home country. Please verify whether you need to pay the SEVIS I-901 fee when applying for your F1 visa renewal. Information on the SEVIS I-901 fee is available at www.fmjfee.com/i901fee. If required to pay the fee, remember to print 2 copies of the payment receipt: one for your records, and one for the visa interview. Please submit the following documents to an advisor for I-20 issuance. Student letter of explanation. Please state clearly and concisely, the circumstances that caused you to fall "out of status." Please type your letter and include your full name, CSUN ID number, the date, and your signature. Please allow three weeks for an FSA to review and process the request. Students may choose to remain in the U.S. and apply for a reinstatement of their F-1 status. Upon verification of eligibility to continue in their academic program at CSUN, IESC will issue a Reinstatement I-20, which means that you are attempting to correct the same SEVIS record. All reinstatement applications are subject to approval by USCIS. The California Service Center may take two to four months to adjudicate your application. It is important that you submit your application in a timely manner, especially if you are applying for the reinstatement in your final semester and intend to apply for post-completion Optional Practical Training (OPT). Students are expected to remain in the U.S. until the decision of the reinstatement application has been made. Students are also expected to otherwise maintain F-1 status (e.g., register in full-time units) while the reinstatement application is pending. All correspondence is done via mail. There is no interview process for this procedure. Please ensure that complete, accurate information is submitted for review. Please bring the following documents to your mandatory meeting with a FSA. Please bring the following documents to IESC for review by a foreign student advisor prior to mailing to the appropriate USCIS Lockbox Facility. Your FSA will give you a letter of explanation for the Reinstatement application, put your application packet together, and give you mailing instructions. Consulting with an immigration attorney of your choice is highly recommended. IESC does not charge any fees for the services it provides to international students. No fees, under any circumstances, shall be submitted to IESC. If a student is submitting an application to the United States Citizenship and Immigration Services (USCIS), a check payable to Department of Homeland Security will accompany the student's application. Advisors’ responsibilities are limited to reviewing the check for accuracy and returning to the student who will mail the application directly to USCIS. Employment is a benefit of the F-1 and J-1 status and is not guaranteed. Always consult with an advisor before starting any employment. It is extremely important to keep in mind that it is your responsibility to engage only in employment authorized as permissible for F-1 and J-1 students. Any unauthorized employment — even if it is for a few hours and/or you did not know it was unauthorized — places you out of status and possibly terminates your status in the United States. Visit the Employment page for details and categories of employment. Students may be authorized to work 20 hours per week during semesters and 40 hours per week during vacations when authorized to work under any of the above work categories. The accompanying spouse and children (under age 21) of the F1 student visa holder are referred to as F-2 dependents. The F-2 dependent visa is a nonimmigrant visa which allows dependents to enter into the U.S. Dependents will need their dependent I-20 in order to apply for the F-2 visa at the US Embassy in their home country. If a student will be in F-1 status, the legal spouse and children under age 21 may be eligible for F-2 status to accompany or follow separately to the U.S. Please contact the international Admissions office at https://www.csun.edu/admissions-records/international for more information. F-1 student submits the Request for New I-20 Form [PDF], additional financial documents ($5,000 for spouse and $3,000 for each child) and photocopy of passport of each dependent to iescrequest@csun.edu. F-1 student picks up F-2 Dependent I-20 from IESC office and delivers them to the dependent(s) either in person or by mail. A new I-20 form will be prepared for each family member. The dependent(s) applies for the F-2 visa at a U.S. embassy/consulate in their home country with their F-2 Dependent I-20 along with other supporting documents as required by the embassy/consulate. F-2 spouses are eligible to enroll in part-time studies (degree, vocational, or recreational) in the U.S. For more information, please visit the Department of Homeland Security's Study in the States website. F-2 minor children are eligible to enroll in full-time studies in K-12 schools. For information about enrolling your child in a public K-12 school, contact the local school district. F-2 dependents are not eligible to work in the US. They also are not eligible to apply for a Social Security Number (SSN). F-2 dependents are eligible to apply for a CA driver's license and state ID, since a SSN is not required for the application. F-2 dependents are not required to travel with the primary F-1. Consult with Foreign Student Advisor (FSA)/DSO at the International and Exchange Student Center (IESC) office at CSUN to ensure your primary (F-1) is in status before traveling. You will need a valid passport and valid Travel Signature. F-2 dependents are able to remain in the US without the F-1 as long as the F-1 maintains status and will return to the U.S. after a temporary absence using the same SEVIS ID number. F-1 and F-2 are admitted for ‘duration of stay'. The immigration status of an F-2 is dependent upon the F-1 student. In order to request an extension of stay, the F-1 student should review the extension of stay requirements and follow the guidelines. For more information, please visit: https://studyinthestates.dhs.gov/dependents OR contact your Foreign Student Advisor (FSA). Wait listing is available. See the guide, Wait List for Closed Classes. Take the Upper Division Writing Proficiency Exam no later than the semester in which you complete 75 units, including transfer course work, to avoid a registration hold. Learn more at UDWPE. Foreign "F" Hold: IESC will start to review your proof of health insurance in March 2019. Your "F" hold will be removed automatically if you have all of the following. You are either enrolled full-time for spring 2019 or have submitted proof of concurrent enrollment or were approved for part-time status for spring 2019. Other Registration Holds: Review your myNorthridge Portal for information on other registration holds. Get all holds removed prior to your assigned registration appointment. Do not wait until your assigned appointment date to get registration holds removed. Allow plenty of time for campus departments to process your requests. Learn how to view your holds in the myNorthridge Portal. Classes fill-up quickly. Class registration begins on April 08, 2019. You will receive an assigned registration appointment date. Learn how to view your registration appointment in the CSUN Portal. Enroll in classes on the day of your assigned registration appointment for the best selection of classes. Learn how to add classes. The add/drop deadline is Friday, September 13, 2019. You must be enrolled in full-time units by this date. Remember that IESC must report your enrollment information to the Department of Homeland Security each semester. Meet with a foreign student advisor no later than the first week of classes if you have not been able to enroll in full-time units. Full-Time Enrollment Requirement: Undergraduate students (bachelor's and second bachelor's) must enroll in at least 12 units every semester. Graduate students must enroll in at least eight units every semester. Part-time status is only authorized for special extenuating circumstances that fall within USCIS regulations. Before you drop below the full-time requirement, you are required to meet with a FSA to discuss your class schedule and the circumstances in detail. Do not drop any classes until the FSA has authorized you to do so. Online Course Limitation: International students are permitted to take one online class or its equivalent to three units of online credits each semester to count towards their full-time enrollment. If you only have one class left to take to graduate, that class must be taken as an in-class, traditional course to be in compliance with legal guidelines governing your F-1 status. Concurrent Enrollment: Students may choose to enroll in classes at another school while they are also enrolled at CSUN. Your SEVIS record would remain at CSUN even though you are enrolled concurrently at another school. If you choose to enroll concurrently at another school, you must do the following by the add/drop deadline. Enroll in a minimum if six units at CSUN if you are an undergraduate student and in a minimum of four units at CSUN if you are a graduate student. Submit the completed Concurrent Enrollment Online Request Form for fall 2019 to the IESC for permission to take classes concurrently at the other school. After you have enrolled at the other school, submit proof of concurrent enrollment to the IESC within one week of receiving your electronic copy of the Concurrent Enrollment Authorization. These requirements are in compliance with Department of Homeland Security regulations and cannot be changed under any circumstances. Payment information is available at the University Cash Services Office, Payment Schedule and Deadlines and How to pay your fees links. Note that students who fail to meet the payment deadline will automatically be dropped from their classes, which may affect their F-1 status. Valid Travel Signature: If you are planning on travelling outside the U.S., make sure you have a valid travel signature for your re-entry to the U.S. Submit the Request for Travel Signature form along with your CSUN I-20 to the IESC. Each travel signature is valid for one year from the date it was signed. Visa Renewal: If you are travelling outside the U.S. and need to renew your F-1 visa, you must request a travel signature. You are responsible for preparing all other documents required by the U.S. Embassy or Consulate in your home country. For more information, please visit Visa Application. F1 students are authorized to work on campus for up to 20 hours per week during the fall and spring semesters, and full-time during summer and winter vacations. Please meet with a foreign student advisor to get the Verification of International Student Status form completed. Are you graduating this semester? Do you want work experience in your field of study after you graduate? Please meet with a Foreign Student Advisor. Do you have a paid internship off-campus offer? Make sure you request the CPT Authorization from a foreign student advisor at the IESC before you begin the internship. To be in compliance with U.S. Immigration Regulations, it is extremely important that the university has current contact information for all international students at all times. Failure to update your personal information with the university will put your immigration status in jeopardy. Need to update your contact information? If you have changed your address, telephone number, email or emergency contact information, simply update the CSUN web portal (SOLAR), and IESC will take care of the rest! Learn more about how to update your personal information in the Portal. When planning to travel outside of the U.S. please make sure to obtain a travel signature on your form I-20. The Travel Signature is valid for 12 months as long as you are maintaining your F-1 status and your passport and visa are valid. If you are on approved Post-OPT or STEM OPT, the travel signature is valid for 6 months. Preparing for Travel: If you are going to a country that is not your own, please confirm the entry visa requirements for that country well in advance by contacting the embassy or consulate of the particular country you plan to visit. Make sure that your visa is valid for your entry or re-entry. An expired visa must be renewed at a U.S. consulate/embassy outside of the U.S. prior to re-entry. If you need a letter verifying enrollment, you may visit Admissions and Records to request one.